Dakshinamurti is an aspect of the Hindu god Shiva, as a teacher. 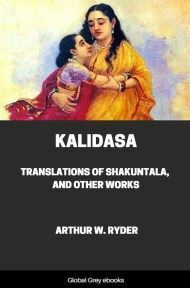 This work primarily contains the Dakshinamurti Stotra, along with commentary by the translator, as well as two shorter works, the Pranava-Vartika and the Dakshinamurti-Upanishad. 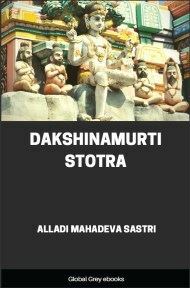 The Dakshinamurti Stotra is a treatise on Hindu philosophy, attributed to the sage Sankaracharya, comparing various schools of thought, including Buddhism, concerning the nature of reality. First Stanza of the Hymn. To Him who by illusion of Atman, as by sleep, sees the universe existing within Himself—like a city seen to exist within a mirror—as though it were manifested without; to Him who beholds, when awake, His own very Self, the second-less; to Him who is incarnate in the Teacher; to Him in the Effulgent Form Facing the South, to Him (Siva) be this bow! 1. Felicity to me may Vinâyaka grant! Felicity to me may Sarasvatî grant! Felicity to me may Mahesvara grant! Felicity to me may Sadâsiva grant! The purpose of the Hymn. 2. The sages hold that there is no greater gain. than the gain of Atman, the Self. With a view to this gain, the sage adores his own Self, the Paramesvara. 3. 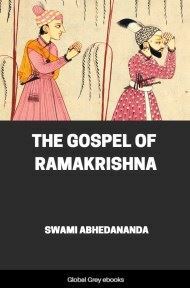 In this Hymn is adored the Paramesvara Himself, who, having entered into the Universe created by His own will, manifests Himself in the mind of every one. 4. Question 1.—We speak of things as existing and appearing. Wherein does this existence abide, as also the light by which they appear? 5. Is it in the things themselves severally, or in Isvara, the very Self of all? or do they inhere in the one Isvara who is said to exist everywhere in the universe as the Self of all, like the genus in the individuals, as the Sruti declares in the Isavasyopanishad, "By Lord is all this to be dwelt in," no distinction being observed as to being and consciousness in all objects of perception except what prevails among the individual objects themselves? Is Isvara, the author of the universe, quite external to it? Or, does He form the very basis wherein the universe has its being? Is it in the very nature of Pratyagatman to be Jiva? Or, is it accidental, due to His connection with an upadhi? Q. 4.—What is meant by "the Self of all?" Is the Isvara, as a matter of fact, the Self of all? Or, is He so described by courtesy? 6. Q. 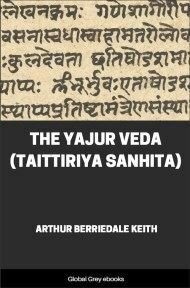 5.—How has Jîva to understand it? What is the right knowledge of these things? Q. 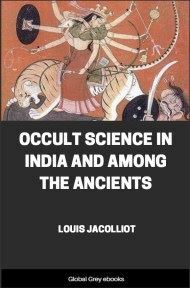 6.—What is the means to that knowledge? Q. 7.—What good accrues to him from the knowledge? Q. 8.—How can Jîva and Isvara be one? 7. How can Atman, the Self, be the All-knower and All-doer? To the pupil thus asking, the Guru proceeds to say as follows. Being mutually opposed in their nature, either they (Jiva and Isvara) are said to be one only by courtesy; or, if they be one in reality, they are mutually opposed only in appearance. Which of these alternatives is meant here? In answer to these questions, the Teacher chants this (Hymn to the Blessed Dakshinamurti). The Universe exists in the Self. 8. All the things which we perceive exist here within (in our Self—the Paramâtman, the Highest Self). Within is the whole of this universe. By Mâyâ it appears as external, like one's own body in a mirror. 9. Just as in svapna (dream) the universe existing in one's own Self is seen as if it were external, so, be it known that even in the jâgrat (waking) state this universe exists within and yet appears to be external. 10. It is certain that the existence of objects seen in svapna is not independent of the existence of one's own Self. What difference is there in the objects of jâgrat consciousness, impermanent and insentient (jada) as they always are? The Universe shines by the light of the Self. 11. In svapna, things appear by the light of one's own Self. There is then indeed no other light. The wise have concluded that the case is just the same even in jâgrat.